After Saina Nehwal lambasted the Indian Olympics Association and the Commonwealth Games Federation for not letting her father enter the games village, the ace shuttler was slammed by her Indian counterpart Jwala Gutta for threatening to not to play at the Gold Coast event. Saina Nehwal in her letter to the IOA had claimed that she wouldn't play if her father's accreditation is not cleared. Indian ace shuttler Saina Nehwal has been slammed by her Indian counterpart Jwala Gutta over her histrionics in Australia before the start of the Commonwealth Games in Gold Coast Australia. Saina in a tweet earlier today had slammed the Indian Olympic Association (IOA) after her father Harvir Singh Nehwal was not included in the list of team official and he was denied permission to enter the Commonwealth Games village. In the aftermath of the shock sidelining, Saina had also written a letter to the IOA threatening that she won’t play in the Games if her father is not accredited as an official as promised. 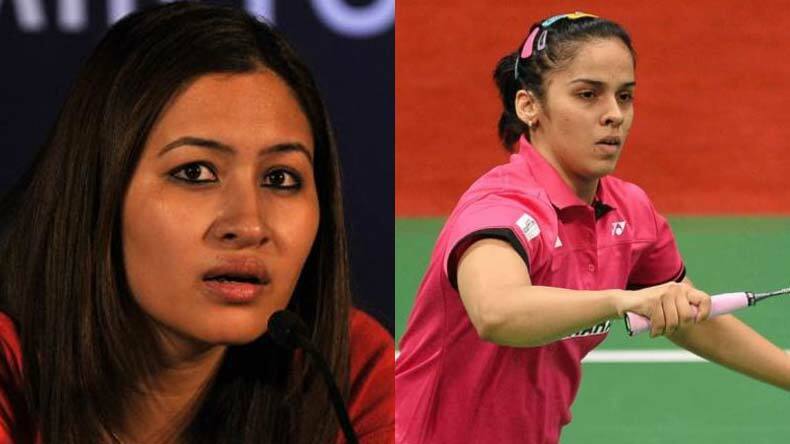 Taking to Twitter, Jwala Gutta slammed Nehwal for her attitude and reckoned that it was not correct on her part to threaten not to play in the coveted tournament. “Hmmm..my family always paid for tickets n stayed in hotels…I have no idea what’s being promised n what’s the demand?? But for the games when u know dates long before the team leaves..isn’t it better to book n plan in advance? Threatening not play..is it correct? ?, Gutta wrote in a tweet. “Funny…how such things like demanding for money awards plots etc etc on social media doesn’t count for controversies…and when asked for right to play is controversial 😒🙄 #hypocrisytoanotherlevel,” she wrote in another tweet. Earlier an agitated Saina Nehwal hours before the start of the Commonwealth Games had complained that her father was unfairly not being allowed to enter the Games village and hence will not be allowed to see her games and that it will be a huge moral loss for the player who wanted support from her father. Saina said that it was shocking for her to see her father’s name being removed from the list despite a confirmation back in India before leaving for Gold Coast. The Sports Ministry had earlier confirmed that parents of star shuttlers Saina Nehwal and PV Sindhu would be travelling to Gold Coast as part of the Indian contingent and that their expense would be managed by the government. However, both the athletes decided to take their parents on their own expense much-obliged to the humble gesture shown by the Sports Ministry. “Surprise to see that when we started from India for commonwealth games 2018 my father was confirmed as the team official and I paid the whole amount for that but when we came to the games village … his name was cut from team official category .. and he can’t even stay with me,” Saina Nehwal had tweeted lambasting at the IOA and the CWG federation. “He can’t c my matches and he can’t enter the village nor he can meet me in anyway .. what kind of support is this,” Nehwal tweeted. “I wanted his support as I regularly take him for my competitions …but i didn’t understand why nobody informed me all this earlier .. that he can’t enter anywhere,” she added in her next tweet. Surprise to see that when we started from India for commonwealth games 2018 my father was confirmed as the team official and I paid the whole amount for that but when we came to the games village … his name was cut from team official category .. and he can’t even stay with me . In a letter accessed by a leading TV Channel, Saina also threatened the IOA of not participating in the Commonwealth Games unless his father’s accreditation is completed. “I msgd u and tried to call u but u didn’t pick up the call but there is so much issue going on with my father..if his accreditation is no cleared as an official I m not going to play the matches,” Saina Nehwal wrote in the letter. Later in the day IOA giving into her demands cleared her father’s accreditation allowing him to stay inside the Games village and support Saina. In a tweet, Saina Nehwal thanked the Indian Olympic Association for the support in sorting out the issues and apologised for all the troubles. “Thank u so much @ioaindia for the support and help sorting out my father’s accreditation card in such short notice ..Hopefully it will b great for the matches ahead ..and I m sorry for all the trouble,” she wrote.